If you’re the one who’s been tasked with organizing your group’s next group event, then consider the transportation arrangements. Booking travel via charter bus is a great idea to get the group together, and have them socializing even before you get to the event! Make the trip a team builder and packed with fun! There’s no reason to have a boring bus ride – all it takes is a little bit of planning and creativity to turn the ride into a great trip! Depending on your group, it may be good to mix up the seating once in a while throughout the ride. This is especially useful if you want members of your group to avoid forming cliques and get to know everyone. Whenever the bus stops for a rest stop or meal break, consider your own version of “musical chairs” and have everyone swap seats. If you do this, be sure to let everyone know ahead of time so they have ample opportunity to gather up their things before moving to a new seat. Particularly for business related trips, or conferences, encourage everyone to make as many new connections during the drive as they can. Combine this with mixing up the seating and there will be ample opportunity for everyone to get to know each other. Not only will this help the time pass by faster if everyone is kept busy, but these new relationships that are built can turn into extremely productive and mutually beneficial business relationships down the road. Most of us have a competitive streak, so why not use that to occupy everyone in a fun way on the bus? For business-related trips, have a contest to see who knows the most answers to a quiz based on whatever industry you’re all in. For fun trips that have nothing to do with business, try a trivial pursuit type of quiz, or make up your own quiz questions based on pop culture. To make this the most fun possible, come up with an inexpensive prize to award to the winner. This can be as simple as a gift certificate, or small edible treat! If it’s not practical to mix up the seating throughout the drive, then keep it simple with a “meet your neighbour” game. Hand out questionnaires to everyone which require them to find out more about their seatmate. Keep it light and fun with questions like “What was your most embarrassing moment?” or “What’s your favourite food?” Enter completed questionnaires into a draw for a prize at the end of the trip. Or better still, once you get off the bus, have a Newlyweds style game show where you see who knows their seatmate best? Award a prize to the winners! Say goodbye to the days of boring bus rides by implementing some of these simple ideas into your next group trip. Your group will thank you for helping them have the best trip ever, and you’ll feel great for being involved in a successful trip! 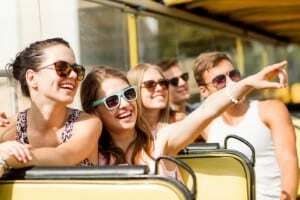 If you’d like to get your group together and socializing for your next trip, contact Switzer-Carty Transportation today for a fast, free bus rental quote!